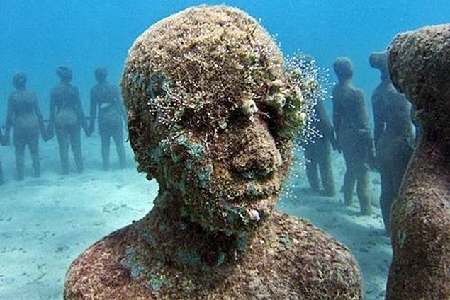 Envision an underwater museum created by man. With no walls to hang paintings, how could this be done…and what’s the point? Developed for the Punta Nizuc National [marine] Park off the coast of Cancun and Isla Mujeres, Mexico, the Museo Subaquatico de Arte (MUSA), or Subaquatic Art Museum, is the answer to an important question: How do we preserve our deteriorating coral reefs? Not only is this museum a tourist attraction but it’s a nature preserve. 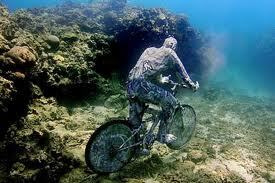 Nearly open for exploration, the Cancun underwater museum will be the largest in the world when completed. Since Cancun, the Riviera Maya, and the Yucatan Peninsula’s ecosystems of rainforests, wildlife, rivers, and oceans are subject to environmental contamination with potentially detrimental consequences for the world, the region harbors many nature reserves. Recent “victims” are the coral reefs of the second largest barrier reef in the world: the great Mesoamerican Barrier Reef System, spanning the coastline of the Yucatan Peninsula, including Isla Contoy, Cozumel, and further south beyond Mexico. Climate change, population growth, and building development resulting in increased sewage, fishing demands, and agricultural chemicals interfere with nature’s ecosystems, especially delicate coral reefs that grow very slowly. Since coral reefs are extremely sensitive to temperature changes and foreign contact, people should not swim near the reefs or touch them. 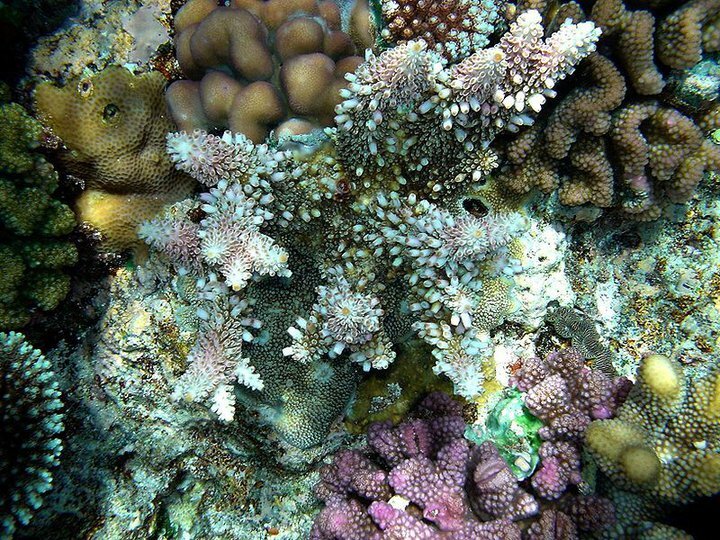 Healthy coral reefs attract many fish and marine life, which are essential to the preservation of our ecosystems. Initiated by the Mexican government to preserve the region’s coral reefs, Cancun’s underwater museum began its first phase on November 14, 2009, entitled The Silent Evolution. Designed to encourage sea life growth, the first three statues of phase one’s 200 sculptures − Dream Collector, Man on Fire, and The Gardener of Hope − were submerged. Development of the underwater museum consists of three phases. Phase I involves submerging 200 life-size statues at various depths throughout the marine park and is well underway. 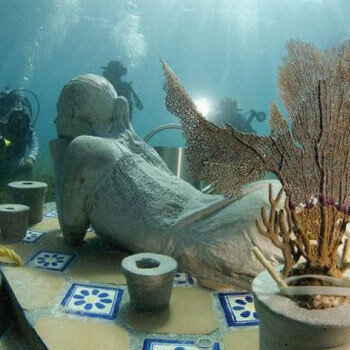 Phase II consists of submerging 200 additional statues across Cancun’s underwater shoreline estimated for completion before the end of 2010, resulting in 400 permanent statues in the underwater museum. Phase III, set to begin in 2011, will invite other local and international artists to submit their statues for installation. Drawing thousands of tourists each year, the national marine park advocates nature conservation while continuing to promote tourist activities, such as snorkeling and diving along the underwater museum’s artificially inspired natural coral reefs. The submerged sculptures are already showing coral, algae and invertebrate growth, and are attracting colorful fish, marine life, and tourist interest! Nearing completion of the first two phases, the opening of the Cancun Underwater Museum will be introduced by Mexican President Felipe Calderon at the end of November 2010.